Putting the harness on for the first time: Take the cinches and traces off of the harness. Slip the harness body over the head, the cinch loop should be on the top of the neck and the breast plate should be between the front legs. Lift the front legs through the harness one at a time. Feed the cinch with the adjustable loops (forward cinch) through the cinch loop at the top of the neck. Feed the smaller cinch (rear cinch) through the slots sewn in front of the d-rings on each side of the harness. Attach the traces to the d-rings on each side of the harness. Checking the harness for correct fit: The webbing at the top of the neck should cross right at the base of the neck between the withers (shoulder blades). While holding the harness in place at the top of the neck, feel under the throat. The webbing below the neck should cross on the breastbone (sternum). You cannot check the fit as you would a collar by slipping fingers under the webbing. If you are uncertain about the fit call us when you have the harness and dog available. Adjusting cinches: Adjust the forward cinch (the one with the loops) so that the loops are just wide enough to go over the ends of the shafts and far enough apart to fit the shafts. Adjust the forward cinch to the shafts on the vehicle before you put the cinch on the dog. 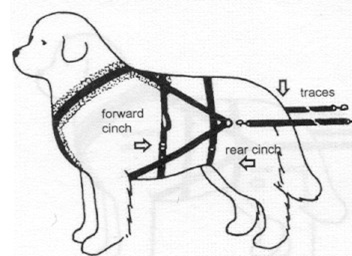 Adjust the length of the cinch so that it is snug on the dog but not tight. The rear cinch should be snug but not tight. The rear cinch helps to keep the harness in place when the vehicle pushes forward as the dog slows or stops. It also keeps the rings from swinging around when the dog is not hooked to the vehicle. If your dog is pulling a light load the rear cinch may not be necessary. If the quick release snaps on the shaft loops do not work well with your shaft arrangement, simply unthread the metal or plastic slides, remove the snaps with their loops, then re-thread the slide to make a loop. Adjusting traces: The traces should be attached from the d-rings on the sides of the harness to a singletree or the front of your vehicle. By adjusting the length of the traces you can correctly position your dog in the shafts. The shafts should extend just beyond the point of the dog’s shoulder. Harness Care: Store your harness in a cool, dry place, out of sunlight. Do not dry over fire or stove—it may shrink up to 10% or more. Machine wash cool, gentle, or hand wash in lukewarm water. Hand to drip dry by d-ring on breast plate. Illustrations from the Newfoundland Draft Work by Consie Powell.